We are delighted to welcome you to Nutfield Church Primary School. This is a very special school which is rooted in six key Christian values: Community, Peace, Wisdom, Hope, Dignity and Joy. Each of these values are underpinned by Biblical theology. Our school enjoys close links to our two churches, Christ Church in Nutfield and St Peter’s and St Pauls’ also in Nutfield. As a church school we welcome children and families of all faiths and those of no faith. Our ethos is one where all are welcome, where love is expressed regardless of race, religion or culture. We have been on a considerable journey over the past few years and are very happy to say that we are ‘on the up’. 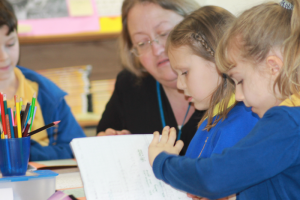 Please read our Ofsted report to find out more about what makes us such a special school. We have a dedicated staff who are child centred and will always put your child’s needs first. We want to welcome and value all children and families. The school has a strong leadership team, rich curriculum, wonderfully energetic staff, extremely supportive parents and governors, an active PTA, which offers some wonderful opportunities to become part of the community and some of the most wonderful children in the world! I am very proud to be leading the team here. If you are thinking of making Nutfield Church Primary your child’s school, I would be pleased to take you for a tour of the school. We arrange regular tours of the school which you can arrange through the office info@nutfield.surrey.sch.uk.